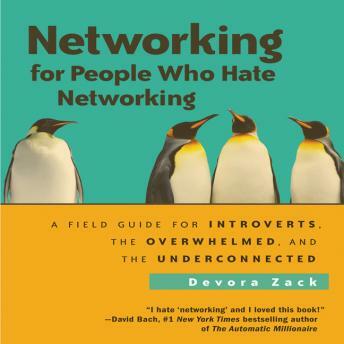 Devora Zack, an avowed introvert and a successful consultant who speaks to thousands of people every year, found that most networking advice books assume that to succeed you have to become an extrovert. Or at least learn how to fake it. Not at all. There is another way. This audiobook shatters stereotypes about people who dislike networking. They're not shy or misanthropic. Rather, they tend to be reflective-they think before they talk. They focus intensely on a few things rather than broadly on a lot of things. And they need time alone to recharge. Because they've been told networking is all about small talk, big numbers and constant contact, they assume it's not for them. But it is! Zack politely examines and then smashes to tiny fragments the "dusty old rules" of standard networking advice. She shows how the very traits that ordinarily make people networking-averse can be harnessed to forge an approach that is just as effective as more traditional approaches, if not better. And she applies it to all kinds of situations, not just formal networking events. After all, as she says, life is just one big networking opportunity-a notion listeners can now embrace.